With flexible classrooms and tutoring resources located in one space, the Center for Teaching and Learning (CTL) and First-year Scholars at Yale (FSY) collaborated to host all ENG 114 classes and office hours at the CTL during Summer Session B.
FSY provides a group of incoming undergraduates with the opportunity to live and study on-campus for five weeks before classes start at the end of August. The program is designed to create a better, smoother transition to Yale with seminars, coursework, activities, and trips. A crucial component of the program is the relationship development that the First-year Scholars build with various academic resources available to them throughout their undergraduate career, including the Academic Strategies Program, Science and QR tutoring, and Writing Support from the Center for Teaching and Learning. FSY is an “invite-only” program; students receive invitations for a variety of reasons. “For example, some students may not have had access to mentors, family, or friends who have attended college,” according to the FSY website. 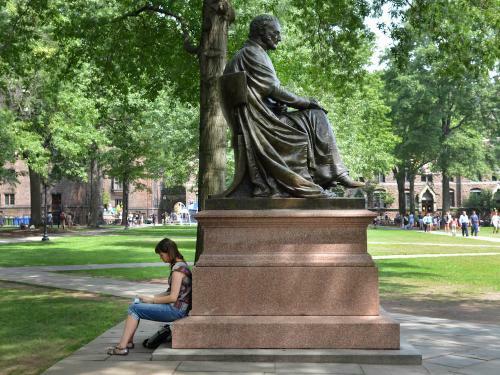 While the Academic Strategies Program is open to all Yale undergraduates, programming is often helpful for first generation students, students from lower socioeconomic families, students from under-resourced high schools, transfer students, and/or student athletes. Contact Karin Gosselink , Program Director, for more information about the Academic Strategies Program.